Y29183 - Carved Dark Stained Cedar Room Number Plaque with Aluminum Numbers and Braille Strips. Shown above are carved dark stained Cedar room number plaques. We made 280 of them. 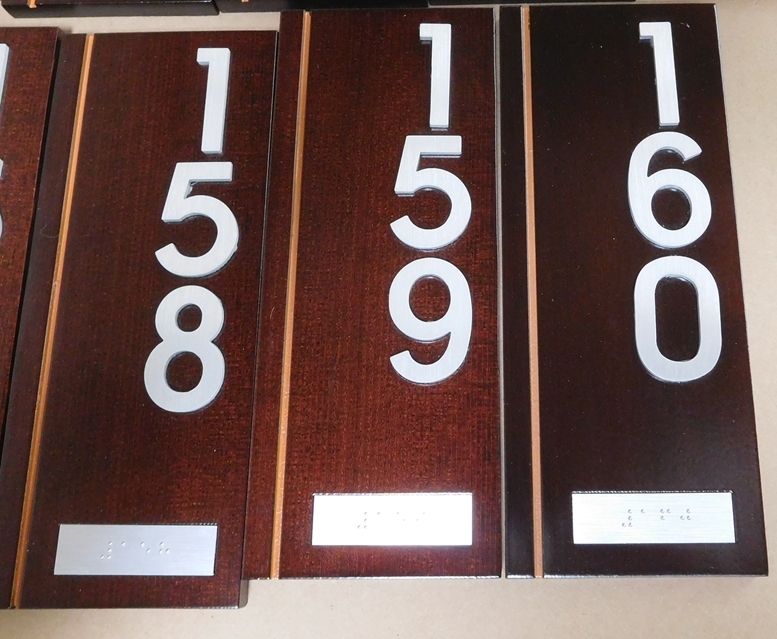 These high-end dark stained Cedar number plaques feature raised brushed aluminum numbers mounted on stand-off studs, and imbedded aluminum Braille strips. These plaques and similar ones can be made of painted High-Density-Urethane (HDU), or stained and painted wood of various species (e.g., Redwood, Oak, Maple, Mahogany, Cherry) . These plaques are clear-coated twice. . They can be mounted with screws or epoxy on an outside wall ,a door, or an inside hall wall next to the room door.